Broccoli: While two weeks later than in 2017, this first broccoli harvest is looking very nice. Half share quantities may be a little small to make a full recipe, but I still wanted to mention one of our favorite broccoli dishes, broccoli salad, from one of our first newsletters. Lacinato/dinosaur kale: Returning members know, and new members will soon be aware, that we eat a lot of kale in this household. Not because it's trendy, or even specifically because it's a “nutritional powerhouse.” We just like eating green stuff and find kale versatile. We sometimes eat it raw in a massaged kale salad, but generally just add it to anything we're cooking: eggs, stir-fry, soup, curry, you-name-it. Even our standard dish, which I call “faux” Mexican. Cilantro: Our first planting of cilantro is kicking out more bunches than any other, so we're still sharing the love. Salad mix: This is our standby mix of eight types of baby-leaf lettuce. We are approaching a production gap — that may be sad or possibly a relief for you, depending on your salad-leanings. Salad turnips: Despite their lack of obvious flare, these white turnips are surprisingly satisfying. They have a mildly turnip-y flavor, a hint of sweetness, and an almost creamy texture that is delicious as a salad topper or as an item on a veggie tray. Use them in this week's recipe. Red radishes: Radishes are featured in this week's recipe. Pretty sure you won't see radishes next week, but will likely get another bunch the following week. Then more in the fall. Red butterhead lettuce: A surprise favorite at the farmers' market, this lettuce is mild-flavored, slightly sweet, and meaty in texture. Plus it's gorgeous to boot. Spinach (full shares only): This has been an excellent season for spinach, despite the heat waves. This is second-cutting from our first planting; you may notice more “arrowhead” shaped leaves. Rhubarb (full shares only): For a unique use, give rhubarb salsa a try. Our jalapeños are still a couple weeks out, so you could either buy some jalapeños or freeze this week's rhubarb. There's no need to blanch for short-term storage, just wash, chop, and pack into a freezer bag. Green leaf lettuce (full shares only): I'm gonna go out on a limb and wager some of you are saying, “another head of green leaf lettuce? ?” I know. I'm sorry. But we just have SO MUCH right now, and it probably won't last another week in the field. We typically lose a decent amount of lettuce to deer grazing, viral diseases, and bolting from heat—not this year. If you have a blender, throw some fruit, water or juice, and a bunch of lettuce in to make a smoothie. It's a great way to use utilize lettuce when you just don't want to make another salad. Sugar snap peas (Rotational--half shares only this week): This first bag of sugar snap peas could certainly just be eaten as a snack, or added to a salad. To preserve shelf life, we don't wash peas, and due to recent heavy rains, some peas have soil on them. Just rinse before using. To minimize any fibrousness, you may want to de-string them by peeling from the stem end down. Strawberries (half shares only): These berries are medium-sized and full of flavor. While we grow them on plastic and mulch with straw between the rows in an attempt to keep the fruit clean, some berries still get a little dirty. Strawberries are easily damaged during washing, so please rinse them yourself just before eating. More strawberries will be coming later in the season from our friends at Little Hill Berry Farm. This week finds us just ahead of the gradual transition out of “greens, herbs, and radishes” season. New items this week include lacinato/dinosaur kale, broccoli (a major crop for us that you'll see quite a bit of this season), and— for half shares this week—sugar snap peas. The peas are coming out a small transplanted plot. I mention this because peas are almost always direct seeded, but in an attempt to mitigate the delay of a snowy April, we sowed some in trays in the greenhouse and hand-transplanted them out in early May. This first harvestable bed is smaller in scale than we usually plant for CSA, so this first harvest is, understandably, smaller than usual. We had enough this week to provide a modest helping to half shares; full shares will get them next week. With any luck, subsequent plantings should produce enough peas to provide at least one more solid bag to all members. As it turns out, the direct seeded peas are only a week or 10 days behind the transplanted peas, so it won't be long. I also wanted to pass along to you all that we'll be working with fruit farming friends of ours in Northfield, Little Hill Berry Farm, to provide you a little more fruit this season. We plan to send you some of their blueberries and everbearing strawberries. This is a great relationship to have, because our strawberry crop this year is looking to be very low yielding. Half share members are receiving some this week, but fruit set looks quite thin and I'm honestly not sure we'll be harvesting much more this season. I'm thankful that Aaron and Molly from Little Hill will be able to back us up on that front this season. The Jujube, also known as the Chinese date, may not mean a hill of beans to you but Michael wants to be the first in his home state of Missouri to extensively propagate the fruit. Why, you may ask? Michael remains unsure as to what draws him to the mystical species in the buckthorn family. Perhaps because it contains twenty-times more vitamin C than any citrus fruit, or perhaps it stems from their sedative properties used to treat anxiety and insomnia in traditional Chinese medicine. The answer remains a mystery. Michael arrived at this decision after studying horticulture at Southeast Missouri State University. Alongside his massive stock of Jerusalem artichokes and persimmons, he would love to start an orchard to conquer the greater Midwest. 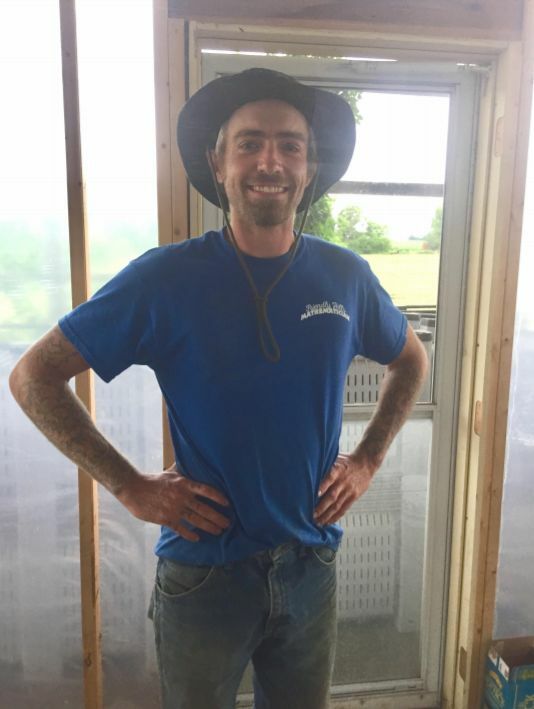 At Sogn Valley Farm, he displays great abilities on the tractor and demonstrates a myriad of patience toward the crew while operating the transplanter. He also manages all microgreen production and greenhouse watering. During the off-season, he works as a welder and voraciously reads about Chinese and Russian culture. He loves heavy metal and 70s progressive rock, and regularly discusses his affinity for both Iron Maiden and Rush. I can safely speak for everyone when I say that he makes the best sandwich in Minnesota. Two trains run in opposite directions. On one track is a copy of Braveheart, and on the other lies Terminator 2. If you only have time for one, which do you save? If you’re asking what’s my favorite movie, then I would save Braveheart. If you could have dinner with any person living or dead, what would you eat? Just bread, because it’s simple. Now my turn for a question. Do you know what my first car was? The AMC Pacer, the same car from Wayne’s World. That’s how much I loved that movie. She considers herself a food activist and has worked at Just Food Co-op and Big Woods Farm, one of the first farms to offer a CSA in the Northfield area. She also plays the piano and is addicted to knitting. On the farm, Becky lends an invaluable hand with harvest and wash-and-pack. She regularly attends local cultural and music events, at which her daughter Helen often sings and plays the banjo. What spurred your interest in food activism? Our general health because the big food companies don’t care. The zombie apocalypse has arrived and you only have time to grab three seed types. What are they? This begs the next question. Why red onions? Because they’re sweet, and I’d need something sweet. I’m making a lacy shawl for my friend’s daughter’s wedding. Next week, Aaron will introduce you to Sam and Elyssa! I was recently reminded of this recipe that appeared in a newsletter last year. It’s easy to prepare, very refreshing, and uses several items from this week’s box. The dressing recipe comes courtesy of my cousin and CSA member Chandler Yorkhall. It’s really less a recipe than a formula to use to concoct a salad dressing out of whatever you have in the kitchen—that’s our style. 1. Mix together salad mix, lettuce, turnips, radishes, and parmesan. 2. Top with hardboiled eggs and walnuts.